A town east of the Dead Sea and a few miles south of Heshbon. It was wrested from the Moabites by Sihon, King of the Amorites (Num. xxi. 30); and after the conquest of Palestine it was assigned, together with the plain in which it lay, to the tribe of Reuben (Josh. xiii. 9, 16). During the war of the Ammonites against David, the Syrian allies of the former encamped at Medeba, which seems at that time to have been under Ammonite control (I Chron. xix. 6-15). Later it was seized by the Moabites again; for, according to the Moabite Stone (line 8), "Omri annexed [all the land] of Medeba, and Israel occupied it, his days and half his son's days, forty years." This statement is confirmed by Isa. xv. 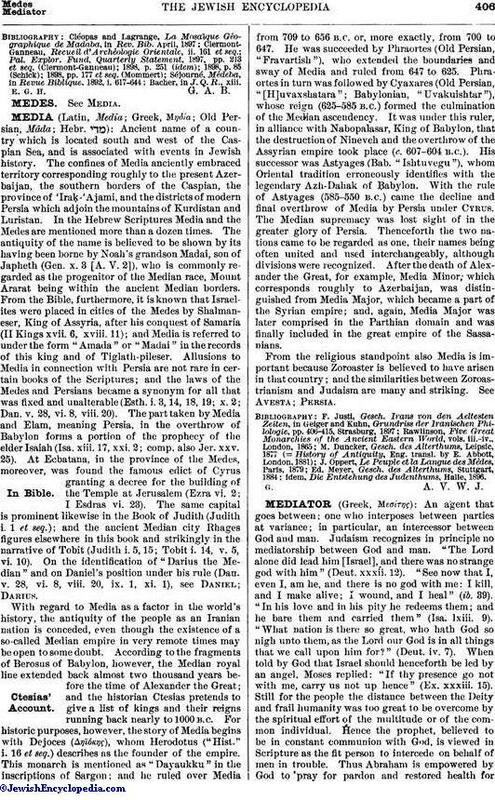 2, which mentions Medeba as a city of Moab, under whose control it remained until the Moabites were driven south of the Arnon by Jeroboam II. During the Maccabean period John, brother of Jonathan and Simon Maccabeus, was murdered by a robber clan, led by Jambri or Ambri, who lived in Medeba, and who in revenge were ambushed and slain while taking part in a marriage procession near the town (I Macc. ix. 35-42; Josephus, "Ant." xiii. 1, §§ 2, 4). It was later taken by John Hyrcanus after a stubborn siege (ib. xiii. 9, § 1), and finally was captured by Alexander Jannæus, although Hyrcanus II. promised to restore it to Aretas, King of Arabia, (ib. xiii. 15, § 4; xiv. 1, § 4). 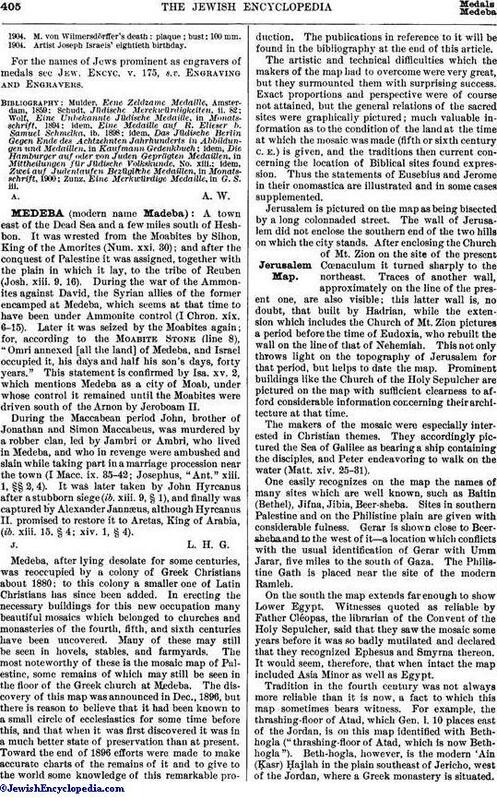 Medeba, after lying desolate for some centuries, was reoccupied by a colony of Greek Christians about 1880; to this colony a smaller one of Latin Christians has since been added. In erecting the necessary buildings for this new occupation many beautiful mosaics which belonged to churches and monasteries of the fourth, fifth, and sixth centuries have been uncovered. Many of these may still be seen in hovels, stables, and farmyards. The most noteworthy of these is the mosaic map of Palestine, some remains of which may still be seen in the floor of the Greek church at Medeba. The discovery of this map was announced in Dec., 1896, but there is reason to believe that it had been known to a small circle of ecclesiastics for some time before this, and that when it was first discovered it was in a much better state of preservation than at present. Toward the end of 1896 efforts were made to make accurate charts of the remains of it and to give to the world some knowledge of this remarkable production. The publications in reference to it will be found in the bibliography at the end of this article. The artistic and technical difficulties which the makers of the map had to overcome were very great, but they surmounted them with surprising success. Exact proportions and perspective were of course not attained, but the general relations of the sacred sites were graphically pictured; much valuable information as to the condition of the land at the time at which the mosaic was made (fifth or sixth century C. E.) is given, and the traditions then current concerning the location of Biblical sites found expression. Thus the statements of Eusebius and Jerome in their onomastica are illustrated and in some cases supplemented. Jerusalem is pictured on the map as being bisected by a long colonnaded street. The wall of Jerusalem did not enclose the southern end of the two hills on which the city stands. After enclosing the Church of Mt. Zion on the site of the present Cœnaculum it turned sharply to the northeast. Traces of another wall, approximately on the line of the present one, are also visible; this latter wall is, no doubt, that built by Hadrian, while the extension which includes the Church of Mt. Zion pictures a period before the time of Eudoxia, who rebuilt the wall on the line of that of Nehemiah. This not only throws light on the topography of Jerusalem for that period, but helps to date the map. Prominent buildings like the Church of the Holy Sepulcher are pictured on the map with sufficient clearness to afford considerable information concerning their architecture at that time. The makers of the mosaic were especially interested in Christian themes. They accordingly pictured the Sea of Galilee as bearing a ship containing the disciples, and Peter endeavoring to walk on the water (Matt. xiv. 25-31). One easily recognizes on the map the names of many sites which are well known, such as Baitin (Bethel), Jifna, Jibia, Beer-sheba. Sites in southern Palestine and on the Philistine plain are given with considerable fulness. Gerar is shown close to Beersheba and to the west of it—a location which conflicts with the usual identification of Gerar with Umm Jarar, five miles to the south of Gaza. The Philistine Gath is placed near the site of the modern Ramleh. On the south the map extends far enough to show Lower Egypt. Witnesses quoted as reliable by Father Cléopas, the librarian of the Convent of the Holy Sepulcher, said that they saw the mosaic some years before it was so badly mutilated and declared that they recognized Ephesus and Smyrna thereon. It would seem, therefore, that when intact the map included Asia Minor as well as Egypt. Tradition in the fourth century was not always more reliable than it is now, a fact to which this map sometimes bears witness. For example, the thrashing-floor of Atad, which Gen. l. 10 places east of the Jordan, is on this map identified with Bethhogla ("thrashing-floor of Atad, which is now Bethhogla"). Beth-hogla, however, is the modern 'Ain (Ḳasr) Ḥajlah in the plain southeast of Jericho, west of the Jordan, where a Greek monastery is situated. Bacher, in J. Q. R., xiii.